Maybe it was because I was having a really crappy day when I went to see it, but I had a great time watching Andrew Stanton's too-simply titled John Carter. I was immersed in the world of the story from the opening (a great flying sequence that sets up both of the film's villains) through to the end. I'm a little disappointed to see the L.A. Times telling me that the film is now considered a flop because it only pulled in $30.1 million this last weekend. I suppose they know whereof they speak, but from this fanboy's perspective it's a wonderful adaptation. It's not perfect and I wouldn't expect it to be, but it's a damn fine presentation of a story that's a hundred years old. The locations are spectacular, the Tharks and the Great White Apes are gorgeously rendered and the villains (previously mentioned) are bad people. The flying machines are inventive, the world of the film is well-built and convincing. The characters are given fully-realized life by actors like Ciaran Hinds, James Purefoy, Dominic West, Mark Strong and even Art Malik makes a brief appearance. Willem Dafoe as Tars Tarkas is having a great time in his role and plays the Thark jeddak with heart and humor. With Hinds and Purefoy back together (I remember them fondly from the HBO series Rome) and on the side of Dejah Thoris, I was sold that Helium were the good guys without question. Speaking of Dejah Thoris, this character was enormously improved for the film and Lynn Collins very much looks the part of the Barsoomian princess from the novel. I couldn't take my eyes off her though some of her lines were clunky, she did a great job in convincing John Carter to fight not just for her, but for Helium and all of Barsoom. She's a Joe Jusko painting come to life, too. Ah, then there's Taylor Kitsch as John Carter. I've never seen him before (I didn't watch Friday Night Lights) but I liked him well enough in the title role. He looks the part and plays it in earnest, even giving some emotional depth to the character in his final scene and when he's fighting the savage Tharks. I think that's more a tribute to director Andrew Stanton than to Kitsch but it makes the movie better. The real scene stealer is Woola the calot. He's the best dog in the universe and you have to watch him when he's on the screen. 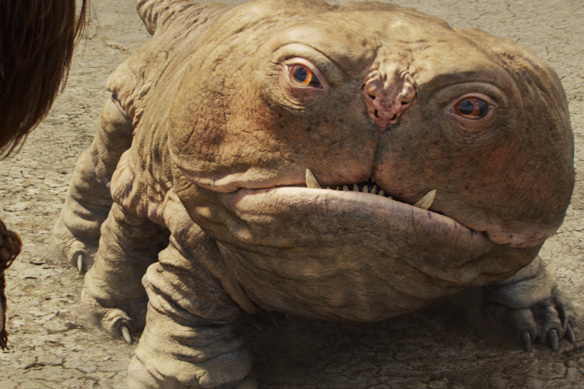 Woola really brings a sense of family to the film. You may not be a fan of the story, you may not be a fan of any of the actors, hell you may not even like SF stories (which is why there's no Mars in the title), but you should go see this movie for the sheer fact that (as my friend Brad Heitmeyer said it) 'this is what a live-action Pixar movie would look like'. Yeah there's a kind of forced almost-love scene, but it's brief enough that you can put it out of your mind. The world of the story (I keep mentioning that, don't I?) is rich and fulfilling and you can get lost in it if you want to. Don't compare it to Star Wars. Don't compare it to the Lord of the Rings. This is the story that all other SF and fantasy stories steal from. Stanton gives it the Pixar treatment and makes it great. Give it a chance and go with an open mind. Let yourself be carried away by the story. You might even find yourself feeling pretty great when you come out of the theater. I did. We finally saw this film today. It's an amazing story. We had a blast watching it, and think this is one to buy and add to our collection.